The Black Hills doesn't get any better than this! Have it all with this five bedroom, 3.5 bath modern home with 4 bedrooms and 2.5 bathrooms all on one level. Not only does it border forest service for hiking, beauty, and wildlife, but it is directly next to an old Black Hills mine. While the mine is safely fenced off, it is an exceptional focal point from the front deck. Enjoy your morning coffee and take in the scenery and wildlife from either deck. 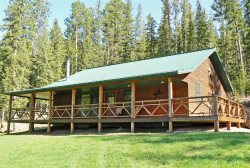 Choose this home to enjoy the beauty of the Black Hills with all modern amenities, or stay here for the convenience to all Black Hills attractions. This home is only a 10 minute drive to the historic nearby town of Custer, making it the perfect place to stay while vacationing in the hills!